How compatible are Aries woman Cancer man emotionally, mentally and sexually? Some believe combining a fire sign like the Aries woman, and a water sign like the Cancer man creates a recipe for disaster. And there can be complications between these opposites. But as we all know and have seen for ourselves, sometimes opposites attract! Is Aries woman Cancer man compatible? Let’s find out in this article. The Cancer male sympathizes with the Aries female’s need for success, for he too works hard to get what he wants. He simply goes after his goals in a quieter manner than his fiery counterpart. When the Aries woman is dating a Cancer man, her impulsive quality may be a turn-off to this more modest male. Her temper could easily offend his sensitive nature. But if he can look beyond her tempestuous self and see the fierce love and loyalty she offers him, the Aries woman and Cancer man relationship can be a wonderful partnership. The Cancer man in love will be the ultimate prince charming for his Aries lover, a gentleman who enjoys being possessed by such a lovely creature. Her complete devotion and love make him feel strong and masculine, and he offers her the same sense of protection and security. The Aries woman and Cancer man love compatibility are one of desire and conquest, as the Aries woman sexually strives to spice things up in his bedroom and he offers her rich sentiments of love and fidelity. The one thing in the Aries woman Cancer man friendship that is common is both agree on being successful. The Aries woman will dive headfirst into any endeavor, while the Cancer man is more subtle in his approach to obtaining his goals. But both the Aries woman and Cancer man soulmates are often wealthy, which helps to maintain a comfortable household for the crab to escape and the ram to unwind. Read more about Cancer compatibility. When it comes to choosing anything – paint colors, dinner plans, vacation destinations – the female Aries will never back down to the Cancer male. Luckily, her partner is skilled in the art of compromise, and he may be able to coax his stubborn lover to his side with the right counterpoint. Because the male crab tends to be shy and reserved, dating a Cancer man is often seen as a challenge for any Aries woman who is attracted to him. Cancer men are slow to act and take their time when getting to know someone, which will either drive the Aries women in love crazy or make her want him even more. But he will appreciate her desire to capture him, as he is steadfast and determined as well. If these two zodiac signs can find harmony between their different strategies, the reward will be worth the wait. Her passion fuels his imagination in bed, and his slow and steady approach is the perfect tease for his Aries woman date. But if he waits too long to satisfy this firecracker, she will see him like a wet blanket. If the Aries woman and Cancer man marriage are to succeed, then they need to be sexually compatible in bed. But this can also bring out the moody temperament of the Cancer man sexuality. This will only serve to frustrate his lover even more and might lead to a breakup. It may take a while for these two to find a delicate balance between her passion and his tenderness. But if the Aries woman sexually is up for the challenge, the Cancer man will not disappoint. The key to maintaining this Aries compatibility between these two sun signs is communication. The impulsive Aries star sign can learn to dial down her temper by listening to the calm Cancer, and he can appeal to her dazzling intellect by engaging her in a debate. 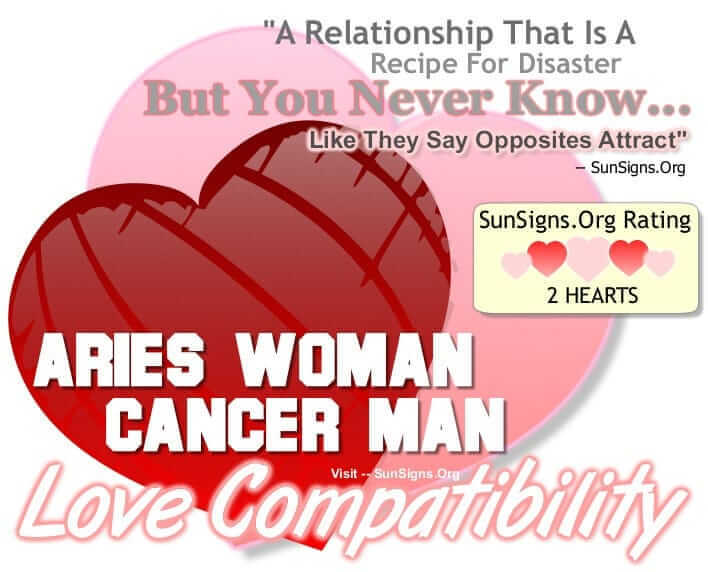 As Aries woman Cancer man are cardinal signs, but one is a fire element while the other is a water sign, the Aries woman Cancer man compatibility gets a FOUR Hearts rating. This kind of Aries woman Cancer man compatibility requires a lot of time and attention, but the Aries woman is up for anything. As long as her Cancer lover counterpart can hang on tight, she will take him far. Are Aries woman Cancer man a good match? Now your questions have been answered.